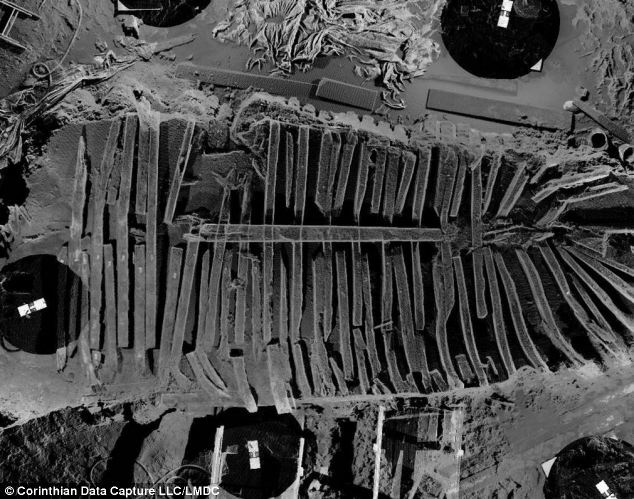 Four years ago this month, archeologists monitoring the excavation of the former World Trade Center site uncovered a surprise - part of an ancient sailing ship. At 22 feet (6.7 meters) below today's street level, in a pit that is now an underground security and parking complex, work was forced to stop as excavators uncovered the ancient ship. Researchers were baffled by the vessel, but a new study has finally revealed how old the ship was - and how it came to be under the site. The team were able to analyse tree rings on the wooden 'skeleton to show the boat came from wood cut in Philadeplhia in 1773. Tree-ring scientists at Columbia University’s Lamont-Doherty Earth Observatory were among those asked to analyze its remains for clues about its age and origins. Researchers at the lab dried the fragments slowly in a cold room and cut thick slices of the wood to get a clear look at the tree rings. <>In a study now out in the journal Tree Ring Research, the scientists say that an old growth forest in the Philadelphia area supplied the white oak used in the ship’s frame, and that the trees were probably cut in 1773 or so—a few years before the bloody war that established America’s independence from Britain.